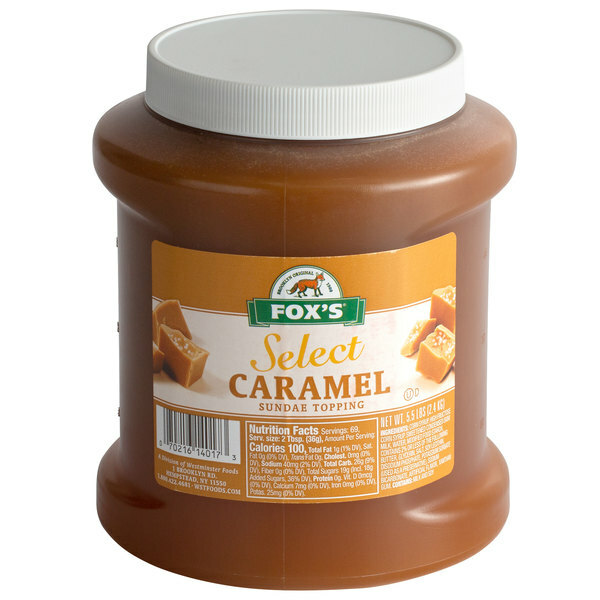 For supreme taste, trust Fox's caramel ice cream topping for all of your sweet treats! Use this warm, sweet topping made from candied and heated sugars to create fantastically-flavored ice cream sundaes. Or, try creating salted caramel brownies or frostings. Drizzle it over brownies, cheesecake, funnel cakes, waffles, and anything else you can think up to delight your guests and keep them coming back for more! "This is a really good caramel. We are using it in desserts as well as in our coffee drinks. It is thick and rich so it does not take as much as the other caramel sauce we were using." Fox's caramel ice cream topping has a smooth, velvety texture and boasts a full-bodied, decadent flavor. Each container holds about 71 servings, so your ice cream parlor, bakery, or restaurant is sure to be in good supply. The resealable lid simply twists on or off to lock in freshness, so you can preserve any unused product. With over one hundred years of manufacturing toppings and flavored syrups, this Brooklyn-based company's tried and true formula for caramel topping is sure to please. Be a part of Fox's long-standing tradition of producing great-tasting ice cream toppings, and stock your ice cream shop with Fox's caramel topping! Great caramel topping for Ice Cream. I have it in a warmer and it always smells so good when I remove the lid to serve. The customers notice! The jars make it easier to use only what is needed instead of cans..
Not bad caramel. It does have a somewhat grainy texture. We have a higher end apple orchard and it didn't work for us. We spent more and got a better quality. We put the caramel into squeeze type bottle to help us drizzle over our German chocolate mini donut. It's also amazing on ice cream. The shipping is always fast. The Packaging could be better.The Product it self is of good quality and easy to work with.The taste is smooth and tasty not extremely sweet. I'm a self proclaimed caramel snob and have to say this is really delicious! Its rich, thick and buttery! Perfect caramel topping for our sundae bar! Fox's caramel sundae topping is very good. Good taste and good price. We have re-ordered a few times. Fox makes good syrup toppings. Can't never go wrong with this brand. This is very thick and rich, I usually just use it as a topping but sometimes I use it with hot drinks. It's too thick to put in cold drinks and it won't blend well but that's not what this is for, so don't buy it trying to get a cheap substitute. It is a very good product when you use it for what it is meant for. I switched to this caramel because the hersheys in a bag was leaving a lot of product behind. These bottles are convient and the product taste great. A very rich and butter like caramel sauce that will be the next hit at your parlor. It makes the best caramel sundae and everyone loves the flavor. This caramel has a great taste and the price is great also. We did have to water it down a little because it is thick. I first tried this ice cream topping to test if my customers would use it. To my surprise, this stuff really sold well. Everyone loves caramel and Fox's made some of the best caramel syrup that I have ever tasted. Now that it has sold so well, I have it on the auto reorder list. 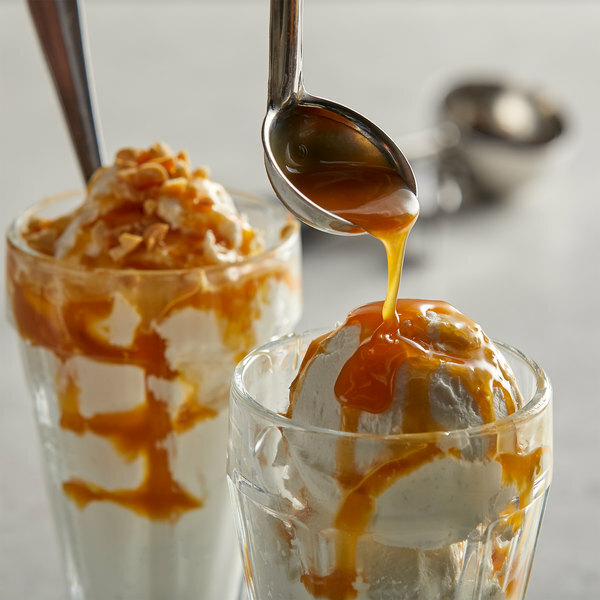 The Fox's caramel ice cream topping is rich and creamy and makes for a delicious ice cream sundae. A very convenient wide mouth jar for easy dipping. This caramel taste really good and is easy to pour, comes in a plastic container. The price and quality is better than anywhere else. Will buy this item again. Not my favorite tasting caramel. It tasted a little chalky. Way easier than making it yourself, but also not as great. It does the job. Caramel topping has continued to increase in popularity. This is a versatile product which is tasty and easily handled. It arrived in perfect condition and will be reordered. I was very happy with this caramel ice cream topping but its definitely not just for ice cream. It has a nice thicker consistency and taste good. I purchased this caramel topping to make my cinnamon caramel pull Sparta with pecans. I will be serving these at my restaurant. My family loves them. This is something I was hoping I was going to love- and I did for what I tried. A quarter of this was really hard and crystallized towards the top. We tried reheating it thinking that would help- however it didn't and it just made it more clumpy. Would not try again, but the bottom of the jar was a great consistency and flavor! I liked that this had a twist top lid vs coming in a can and you have to use everything or re-container it. Has a great taste and wonderful for a heated ice cream topping!